Tina Faulkner Elders began training as a young child in Gong Fu and Chin Na with her father, Gordon Faulkner. During this time Gordon was also teaching the internal practices and meditations of Mantak Chia. Over the years Gordon would frequently host one of Mantak Chia’s most senior students and illustrator, Juan Li. These early encounters sparked a lifelong curiosity for Tina and an eagerness to learn Taijiquan. At twenty she moved to Beijing to study Daoyin Yangsheng Gong at the Beijing Sports University, graduating in 1996. At this time she entered international competitions, winning a number of medals. Whilst living in Beijing, Tina began studying with Master Shi Ming, a national treasure of China and author of Mind Over Matter. On her return from China, Tina oped her own school in Aberdeen (Scotland) and taught regularly in America. She had the privilege of studying with and hosting Professor Li DeYin on a number of occasions and also acting as ambassador when Professor Li DeYin was invited to teach in New Hampshire, America. Tina has continued to return to China, over the years, studying ‘Health Qigong‘ known as Daoyin Yangsheng Gong at the Sports University of Beijing. Around ten years ago Tina was introduced to Master Chen LiSheng, 15th Generation Disciple of Wudang Xuanwu. 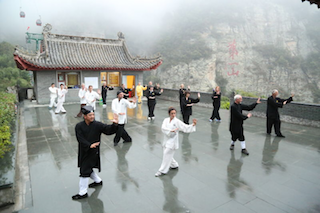 Tina’s school has recently been awarded the first Teaching Cooperation to the Wudang Daoist Wuji Gongfu Academy, thereby creating a direct cultural link to Wudang Mountain. Now her continued self cultivation takes her to WuDang to study Taijiquan, Qigong and more recently Baguazhang with Master Chen. Tina regularly hosts Master Chen LiSheng in the UK and organises study trips to the Wudang Daoist Wuji Gongfu Academy, Wudang, China. Her school has been running private and public classes as well as teaching in the healthcare sector for nearly twenty years. Some of the organisations include the Confucius Institute of Aberdeen and the Maggie Centre for cancer care. For centuries the Five Animal routines have been very popular Yangsheng practices throughout China. The mimicking of each animal through movement, mind and breath naturally follows the energy of each of the five Elements (Water, Fire, Metal, Wood and Earth). Therefore these routines aid in bringing balance and harmony to the internal organs of the body. Over the years many forms have been standardised, but the Wudang Five Animals have not. These strong yet playful routines remain true to Wudang’s original style. They focus on internal power and aim to bring the practitioner back to nature. The Wudang Five Animals are: the ancient Turtle, the coiling and darting Snake, the playful Tiger, the powerful majestic Dragon and the elegant Crane. On our Youtube Channel “Qigong Excercises” you will find videos with Tina and other Qigong teachers. New videos with Tina will be posted there soon. What is Taijiquan, Qigong, …? Copyright © 2019 taiji-forum.com. All Rights Reserved.